If candlelit dinners seem old hat, corney cards make you groan, flowers make you sneeze and chocolate breaks the diet, you could try something completely different. 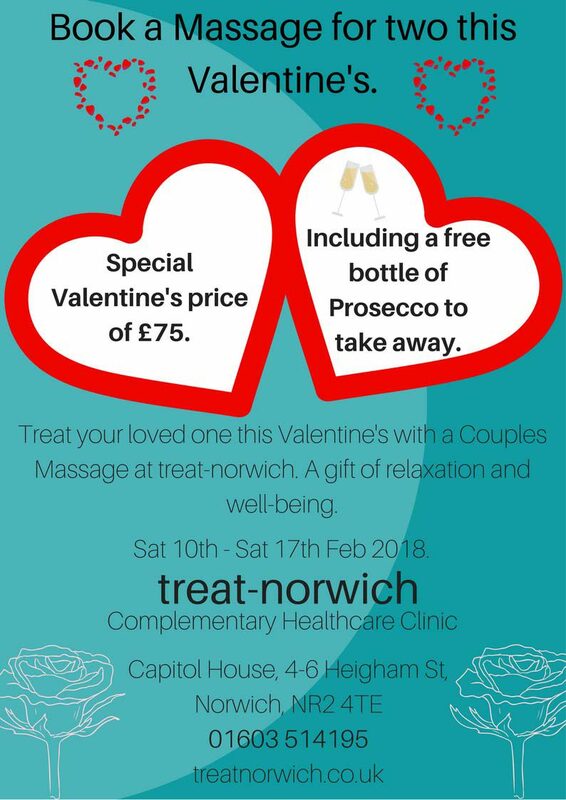 This year Treat are offering a relaxing massage for two in our intimate couple’s room with our skilled sensitive therapists. Is there a better way to show your love than a gift that is positive, healthy, relaxing, calming and one that stimulates oxytocin, the "love hormone". We are even giving away a bottle of Prosecco to take home with every massage! Nothing says love and care more than a massage, it even has postitive benefits for the heart, the symbol of the day. Whatever plans you have for the day or night ahead, relaxing together, boosting mood and chasing away any aches, pains or tension will set the tone for a romantic loving Valentine. Call 01603 514195 to book a couples massage for you and your partner or as a gift to another. We also sell Gift Vouchers at Treat, so if you would like an individual massage gift for that special person give us a call.